"How to Clean Optics on $500 Or Less"
A primer by Company Seven about cleaning telescope, binocular, or camera lenses and mirrors. One of the greatest risks faced by a telescope is that threat of an over zealous owner who lives life only to keep their telescope optics clean as new. These people should never use the telescope and instead leave it stored in a vacuum chamber. We believe in cleaning telescope optics only as is necessary (after a food fight, or a visit to Newark, New Jersey, etc.) and so for the rest of us, we provide the following advice. WARNING - If you own a refractor that is air-spaced, or one that employs a complex lens contact C-VII or the manufacturer for more specific advice on cleaning. Do not remove a refractive lenses from the lens cell (holder), especially a triplet apochromat or Fluorite lens - there are very few individuals who have the experience and equipment to properly handle complex lenses. The same advice applies for most complicated eyepieces. If you have any doubt about your abilities, then do not tamper with the lens; ask your retailer to do the cleaning. If done properly, the cleaning can be done with no degradation of optical performance. GETTING TO THE DIRT: Since most refractive and catadioptric telescopes are closed systems then it is probably not necessary to clean inner lens surfaces. Cleaning the field (R1 or outer) lens may be accomplished with the lens in the cell, and the cell attached to the optical tube. If necessary, remove the lens cell (with optics within) from the tube. It is best to leave the lens retaining ring in place, and work with the lens in the cell. Do not make adjustments to (tighten, or loosen) the retaining ring. It is not abnormal to hear a slight rattle if you shake a refractor objective in its cell since the factory set spacing accommodates expansion of the lens due to typical environmental temperature changes. We discourage our customers from attempting to remove the Corrector Lens of a Schmidt-Cassegrain or Maksutov-Cassegrain telescope since there can be problems to be overcome that may not be obvious to the novice. Most Newtonian mirrors are held within a Mirror Cell which can be easily removed as one assembly from the telescope tube. 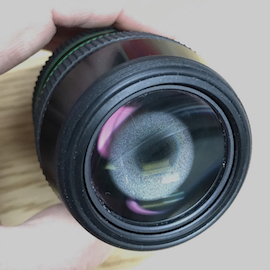 Pay extra attention to the orientation of a lens/mirror cell within the tube - you may wish to mark the tube and lens cell where they meet with a dab of white-out or fingernail polish; be careful that your cleaning procedure does not remove the index marks! Set the optics onto a clean padded platform, with the surface of a mirror or lens to be cleaned upright. Loosen retainers on the lip of mirror and remove them, take care not to tilt or rotate the mirror. CLEANING METHODS: The cleaning methods applied will depend on the nature of the contaminant. The main concerns are that one should not make the problem worse by doing something wrong, and that one be properly equipped for the task. The basic steps involved in decision making and cleaning an optical surface are represented in the following chart. Note that this does not include any mention of disassembly, assembly and alignment. Keep it in mind that one will only have to proceed as far as is necessary to achieve a satisfactory result, that is to say that if blowing a surface clears the obvious contaminants, then there is no need to proceed with any further steps. BLOW: Company Seven suggests the use of compressed dry Nitrogen gas. This is inert, cost effective in quantity, and readily available. Be sure that any compressed gas cylinder you use has a regulator that can maintain the gas pressure at 30 psi or lower on the downside. The cylinder should be DOT approved, and be maintained within hydro-stat testing requirements. Insure that a safe, pressure rated hose with an OSHA approved 30 psi manual valved nozzle is attached to the hose to better direct the discharge. Never point this nozzle at a person. 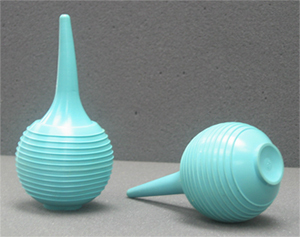 A viable option is to procure a large rubber bulb syringe/aspirator at a drug store (typically near baby supplies), or from O.B. kits if you know a Doctor or a paramedic. These units are similar to those units found at camera stores, but are larger and more effective. Avoid small bulb units with a small brush attached to the nozzle - these block or inhibit the already meager airflow. We advise our customers not to employ compressed Freon/Fluorocarbons (watch the Ozone layer! ), or other similar canned air products. Most of these canned products are comparatively expensive solutions compared to a Bulb Aspirator. And these solutions are often empty when you need them most. If you do choose to use a compressed gas dispenser can with an attached plastic nozzle and tube, then first spray a brief burst of the air in a direction pointing away from the lens since any moisture in the air within the tube will condense (adiabatic compression) and deposit onto the lens. Hold the can upright, and do not to shake the can while you are discharging it. BRUSH: Any remaining obvious particles might be removed with a clean fine camel hair brush. We suggest (and used to sell) the Staticmaster brushes which also incorporate a Polonium 210 element to neutralize static charge. When approaching the lens surface use the brush with a very light passing pressure. Do not press the brush hairs into the surface of the lens or mirror so that the brush flattens out since doing so could cause hard contaminants such as a sand particle to drag along the surface thereby scratching the microns-thin optical coatings. Also avoid touching any brush or having it come into contact with oils or smear stains such as eyelash oils or fingerprints; this will contaminate the brush and may spread the contaminant. Staticmaster or camel hair brushes may be cleaned with a clear (not colored) mild soap water solution, and rinsed. Or with alcohol. WIPE: Procure unbleached white 100 per cent natural cotton balls, a professional grade lens cleaning tissue, or a fine linen cloth. The cotton balls may be easiest to source as these may be purchased at a drug store. The cotton balls average about 1 inch in diameter but these may be too large for some small, or hard to reach surfaces such as an eyepiece field lens. For instances where the large cotton swab is too cumbersome we suggest you employ a "Q-Tip" cotton swab. If there appears to be no fingerprints, grease, or oils on the lens then you might not require a detergent cleaner and may then proceed with water. Dispense clean water (ideally distilled water, or detergent lens cleaner described below) onto the cotton. Lightly spray the surface of the cotton ball that will contact the lens; among the more important concerns when cleaning multi-lens systems such as eyepieces is that if you put too much fluid onto the cotton the excess may run off the lens surface and flow under a retaining ring and disperse in between the lenses. Excess liquid may run into other areas of a system and promote rust, lens staining, or other adverse effects. Dampen the cotton just so that the cotton ball is able to glide across the surface to be cleaned. Right: moisture that migrated to between eye lenses of an eyepiece due to improper cleaning technique (75,256 bytes). The owner sprayed lens cleaning fluid directly onto the lens, instead of lightly spraying onto a cotton ball or tissue. This may dry out in time but could leave residual staining that would distract the observer, so this needed to be returned to Company Seven for proper remedy. Gently pass the damp cotton ball or cloth across the surface allowing the attraction of the liquid or the weight of the damp ball to apply the pressure on the lens surface. This gentle gliding action across the surface will reduce the possibility of pressing particles into the coating, thereby causing scratches. After each short pass rotate the cotton ball to a clean face (one that has not been touched with your fingers), or replace the cotton ball with a fresh dampened one as this will minimize the risk of spreading oils or dirt along the surface. If particles of the cotton balls remain on the lens these may be blown off with air or gas pressure, or brushed off with a clean soft brush. 2. Dissolve Contaminants: If there is grease or oil on the lens such as that from an eyelash or a fingerprint, then you will need to blow off what particles you can and then employ a safe mild detergent cleaner or some other chemical to dissolve it. If this is the case, proceed with a reputable mild detergent lens cleaner. The ONLY brands which Company Seven endorses are the Carl Zeiss Lens Cleaning Fluid, and the ammonium carbonate solution offered under the Kodak trademark (Kodak catalog number 176 7136, in the 1.25 fl. oz. size). This is not to state that others are necessarily unsafe, however in the case of Carl Zeiss and Kodak we know that they are consistently safe. If you buy an off-brand miracle cleaner you really do not know who made it, or what is in it. 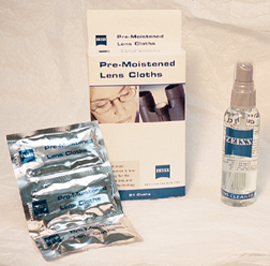 Since it is often inconvenient to carry fluid bottles and cotton balls into the field, Company Seven does offer Carl Zeiss Pre-Moistened Lens Cloth packets. These are clean white cloths, moistened with Zeiss Lens Cleaning Fluid, folded into very compact form and then sealed in aluminum packets to maintain cleanliness. These packets are easily stored for travel, and are readily put in service. Either the Kodak or Zeiss fluids will evaporate quickly, and they may leave some mild harmless residue, this is not unlike the soap stain often seen on crystal glassware after dish washing. The residue is not harmful, and will have no perceptible impact on lens performance. If you wish to remove or reduce the perceptibility of the detergent residue then use clean water with a wiping cloth or cotton ball as your "rinse cycle". 3. Acetone and Alcohol: If the detergent fails to remove the contaminant then you may wish to employ acetone or alcohol. However, consider the risks since acetone and alcohol are a flammable liquid, and so these solvents should not be used in confined or unventilated areas. The user should wear industrial eye protection (goggles) and rubber gloves to avoid contact with the skin or eyes. And be certain that acetone does not come into contact with any plastic or painted surfaces as this may cause them to melt or smear. And no smoking when using these solvents! Aside from being a stupid and costly addiction, smoking is not a good idea around telescopes since the byproducts of combustion deposit onto lenses and mirrors. The residue deposited can be harmful to most optical coatings. As the surface comes clean then you may employ the water in place of the detergent or acetone, this is in effect the rinse cycle to reduce any obvious but harmless residue from the cleaner. Use the cleaning fluid in the manner described above, you may choose to follow-up with a water rinse to eliminate any harmless detergent residue. 4. Reassemble: the optical tube or replace the mirror retainers and place the mirror holder into the tube taking note of the indexing marks. Check collimation/optical alignment, this can be done with a natural or artificial star test. Do not use home-brew lens cleaners, or abrasive cleaners or pads on lenses or mirrors. Disposable natural cotton balls are a better choice than common lens cleaning tissue. Do not breathe or blow your breath across a lens - especially if you recently ate a pepperoni pizza. Keep lenses or optical tube assembled covered when not in use. Do not let any cover come into contact with the optics. Some plastic flexible covers have been provided with some telescopes and may flex and come into contact with the objective. Do not pack a moist optical tube into a closed case or plastic bag for an extended time. After each use, bring the optical tube into a warm dry room and let it dry out before closing it. Pack optics in containers for long term storage with moisture absorbent materials (desiccants such as silica gel) if possible. Do not store telescopes in a damp basement or open attic; a moist environment contributes to the growth of fungus. Avoid exposing optics to salty sea-air. The salt in the air may deteriorate of mirror or antireflective coatings. If you expose a telescope to sea air dew, then clean the exposed optical and mechanical surfaces. Do not use compressed/canned gasses on Fluorite lenses. The thermal (cold) shock could cause or contribute to cracking of Fluorite elements (especially at the edges) which might not become evident until much later. U.S.P. Collodion; Company Seven does not recommend the use of Collodion for consumers because this is a highly flammable narcotic which requires environmental and personal protection safety equipment. Binocular Care And Service Interval Advice: Suggestions by Company Seven An illustrated overview discussing the mechanisms that compromise the performance or longevity of binoculars. We provide some tips about preventive maintenance, identifying problems, and what to do when your binocular is damage or in need of servicing. "Company Seven: Zeiss Lens Cleaning Fluid Materials Safety Data Sheet", our six (6) page color illustrated document explaining the health and safety implications of the Zeiss Lens Cleaning Fluid distributed by Company Seven and as is referred to in our article "Cleaning Telescopes And Most Consumer Optics". This document includes advice for medical professionals regarding treatment of accidental exposure to the eyes or ingestion. From Company Seven's Archives. Download size is 10,109,563 bytes (in Acrobat Reader ".pdf" format). "Company Seven: Zeiss Lens Cleaning Towelette Materials Safety Data Sheet", our six (6) page color illustrated document explaining the health and safety implications of the Zeiss Lens Cleaning Towlettes distributed by Company Seven and as is referred to in our article "Cleaning Telescopes And Most Consumer Optics". This document includes advice for medical professionals regarding treatment of accidental exposure to the eyes or ingestion. From Company Seven's Archives. Download size is 9,669,387 bytes (in Acrobat Reader ".pdf" format).